If you don’t live in Boston, you probably don’t know about the struggles faced by students during the dreaded move-in period. Every year, between late August and early September, new and returning students move into dorms or new apartments near the city’s universities. While moving week is a common occurrence every year, that doesn’t dampen the annoyance of dealing with streets flooded with furniture, traffic delays, and finding alternative routes to work etc. Inspired by the heat map for 2016 used by Kyle Scott Clauss, we decided to take a deeper look into the madness that is Boston move-in day (note, though, that the data/heatmap is no longer available on the Data Boston website for 2017). After all, it always helps to know which areas to avoid around the move-in dates in the city. A weekly heat map of Boston showing the number of issued moving truck permits on a weekly basis. A daily heat map of Boston showing the number of issued moving truck permits on a daily basis. Like the previously published maps, both of the embedded maps below show the addresses of the moving truck permits that were issued. Looking at the maps, it is easy to spot which neighborhoods are busier than others, and under which time frame and dates. When breaking down the weekly map, you can see that there are not a lot of spikes in issued moving truck permits until the week of August 28 to September 4, 2016. Much of Boston is pretty congested and busy around those dates, specifically the neighborhoods that is also the home to, or in close proximity to, Boston’s schools and universities. Other periods where the map showed a higher than normal amount of issued moving truck permits are around May 22, 2016, to June 5, 2016, and the week of June 26, 2016, to July 3, 2016. Also, some dates throughout late July and early August have more than the usual number of issued permits, but this is to be considered normal as people do tend to move during the Summer months for other reasons than commencing school. However, it is nowhere near the spike we see from the week of August 28 to September 4, 2016. Now, let’s take a look at the next map, taking a closer look at the daily number of issued moving truck permits. September 1, 2017: 865 permits are due to expire on this day. August 31, 2017: 478 permits are due to expire on this day. August 26, 2017: 194 permits are due to expire on this day. September 2, 2017: 193 permits are due to expire on this day. August 30, 2017: 159 permits are due to expire on this day. We see that highest numbers of expired permits fall within the typical move-in period for students. Expect to see the streets of Boston being a bit more hectic around these dates, and use the map to see which neighborhood would be affected the most. From the data provided, it is safe to say that there is a relationship between the number of issued permits and the move-in period for new and returning students in Boston. Looking at the number of issued moving truck permits all the way back in January 2013 to September 2017, this is how the numbers are divided. 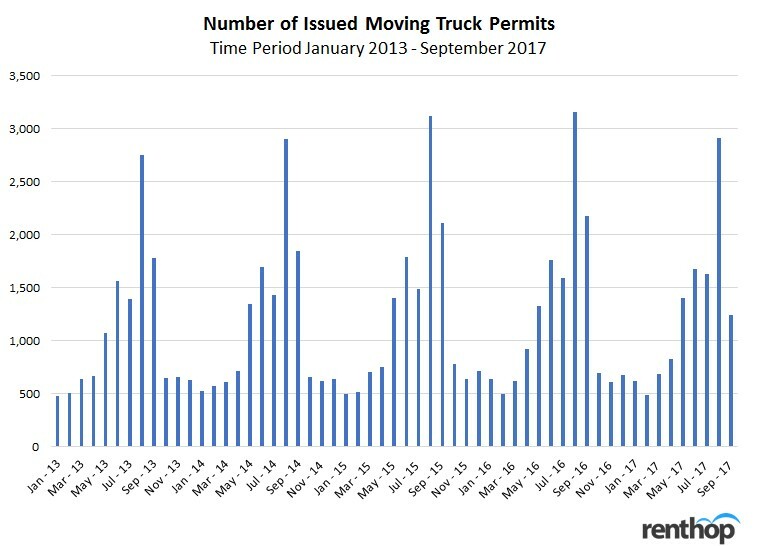 Looking at the chart displayed above, we see that August is the clear winner for most issued moving truck permits for 2013, 2014, 2015, 2016, and 2017. Nothing seems to really spike until August comes around. May, June, July, and September are the other months that show a higher than the average number of issued moving truck permits. Let’s take a closer look at the months with the highest number of issued moving truck permits. The table above takes a closer look at the number of expired moving truck permits all the way back from 2013 to today. August 2016 is a clear winner with 3,160 issued permits. 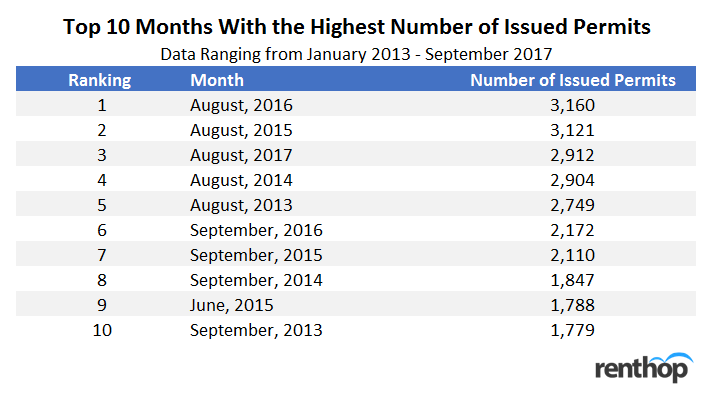 Furthermore, we’re seeing that the month of August ranks the highest for the five last years, which shows that there is a high correlation between issued permits for moving trucks and the move-in period for new and returning students. From August 2013 to August 2016 there was a 15 percent increase in the number of issued moving truck permits. August 2017 has only 2,912 permits issued so far but we were only able to pull data up to September 16, 2017, so far. The numbers leave us curious to see how many issued permits we’ll see this year for August, and if August 2017 will beat August last year. So which areas are the worst to commute in around the move-in period? For you to know which area to avoid, we took a deeper look at the zip codes attached to the issued moving truck permits as well. Knowing which zip codes that are the busiest might help you to plan ahead, if it affects your daily commute to work, the gym, etc. We ranked it by the top ten busiest zip codes based on the number of issued permits. The top zip code with the highest number of issued permits is 02135, which is assigned to the Brighton neighborhood. Boston College is located in Brighton, which could have something to do with the high number of permits for that specific zip code. The runner up is zip code 02114, also known as the West End. The area is located in the midst of the City Center and is a popular place to live. Suffolk University is also in close proximity. 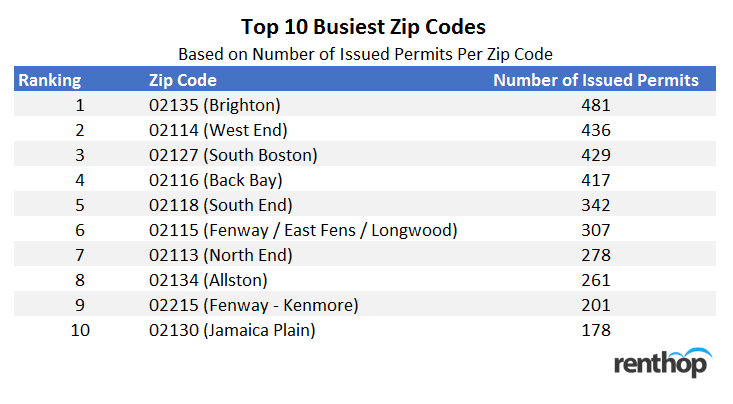 The zip code ranked as number ten is for Jamaica Plain, with only 178 permits compared to Brighton’s 481 assigned permits. If you have a school or university near where you live you probably already know that there will be more traffic than usual around the move-in period. But exactly when is the move-in dates for your local university or school? It might be worth checking the academic calendar to ensure you mark the dates that your area will be busier than normal. Here are just a couple of move-in dates for Boston schools and universities that are coming up in the next couple of weeks, based on the academic calendar for 2017. Check the embedded map to figure out alternative routes to the gym, the store, or work. Take a minute to map out some routes, other than your normal route, if you can see from the map that your normal route might be rather busy. No one wants to get stuck in the middle of a traffic jam or behind a big moving truck on a narrow road. Do some research on the route before heading out to save yourself from a headache. Despite all your best efforts and planning, there are some delays and annoyances that are going to be impossible to evade. Especially in a city as close quartered as most of Boston is, a single vehicle being out of place or stopped for too long can cause some major issues. As a result, you should give yourself more time each and every day to account for the potential delays. While you might miss out on the delays you planned for and be very early to work or class, that is better than not giving yourself that extra time and hitting a delay, making yourself very late. While this tip isn’t so much about helping you avoid the madness that is Boston Move-In Day, it can make it much more manageable for you. The fact is, there is a high chance of your commute or drive being disrupted in some way due to the moving. Instead of thinking you will get through without a hitch and then getting upset or angry when you get stopped, expect and accept the fact that it is likely to happen. Simply expecting to be disrupted by the madness will make it less bad when it occurs, and if it doesn’t, you will feel like you just hit the jackpot. While many will avoid this area at all costs, there are also those all deliberately look to go to these areas around move-in day. The reasoning for this is “Allston Christmas”. For those unfamiliar, Allston Christmas is the period around move-in day in which a ton of people are moving in and out of apartments. While most of their furniture will make it into a U-Haul or an apartment, there are always some just left on the street, free for anyone to take. So instead of treating this whole ordeal as a disturbance or a huge place to be avoided, treat it as an opportunity. There is a good chance you can find some pretty cool things simply laying on the sidewalk or in the street.